Peel the sweet potato, cut into 1 inch chunks and boil in water to cover for 15 to 20 minutes until fork tender. Drain and place the sweet potatos in a mixing bowl. Add the soymilk, salt, garlic powder, and nutmeg. Mash with a potato masher. Add the flour and stir to combine. Knead with your hands for a couple of minutes or so to form a dough. Add more flour if needed to form the dough. Place the dough on a floured surface. Divide into quarters. Using your hands, roll out 1/4 of the dough into a long rope-like strand. Cut into 1 inch pieces. Using your thumb, roll the pieces of dough against the back of a fork to form ridges in the dough. Repeat until all dough has been formed. Bring 3 quarts of water to a boil and add a pinch of salt. Working in batches, place 12 to 15 gnocchi in the boiling water. When gnocchi float to the surface, boil another 2 to 3 minutes. Remove with a slotted spoon and drain. Repeat in batches until all gnocchi are cooked. To prepare the sauce, heat oil in a large skillet and sauté shallots for 2 minutes. Add the sage and flour, stirring constantly. Quickly whisk the soymilk and water into the flour mixture to avoid lumping. Season with sea salt, pepper and more sage to taste. 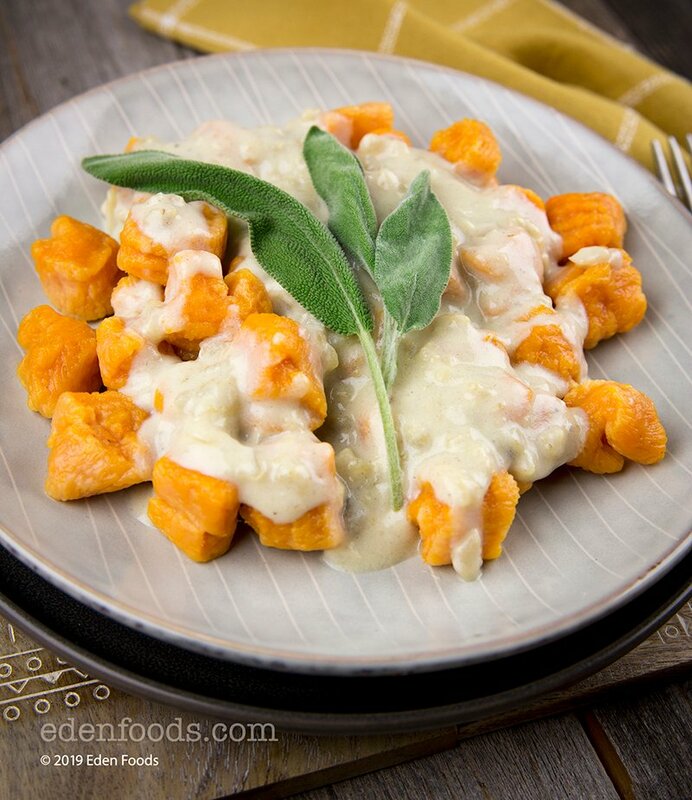 Place the gnocchi in the cream sauce and mix well before serving. _b_NOTE:_/b_ Remaining dough can be stored in an airtight container in the freezer.